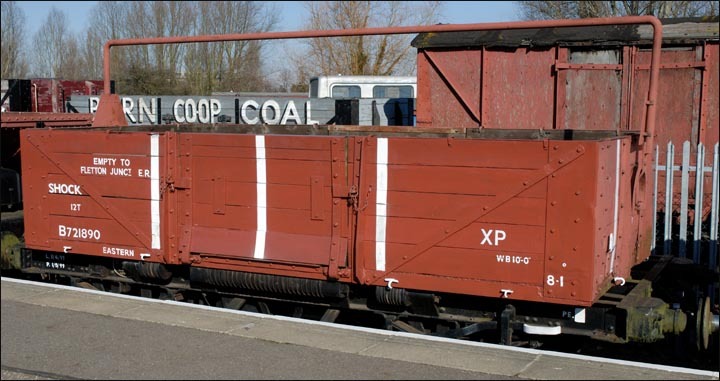 These Shock wagons had large springs (see spring under the centre door) to help with the shocks when hard shunting was undertaken, when breakable or fragile cargos were being caried. The wooden wagon body is a little shorter than the under frame .The three white stripes on the sides and ends were also on the Shock vans as well. 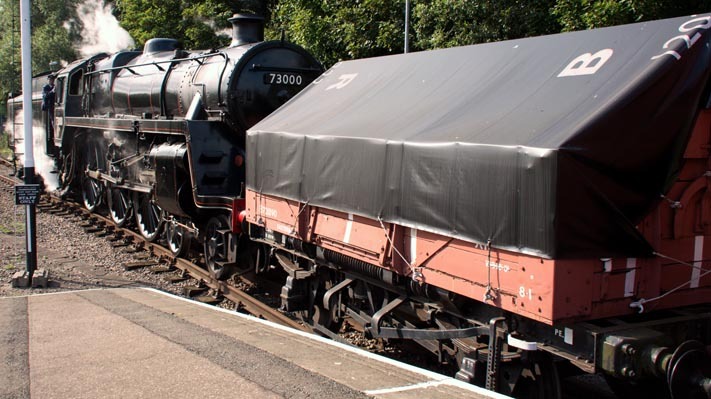 12T open SHOCK wagon number B721890 with a BR tarpaulin over the wagon. Note the ropes using the 4 hooks placed for that job along the wagon. Class 5 City of Peterborough had been given a new number and its nameplates removed just for the September 2014 steam gala. The locomotive was shunting the wagons back into the bay at the Nene Valleys Peterborough station at the end of the day.